The UK Housing Market has seemed fairly doom and gloom for a little while now as Brexit decisions continue to drag on. However, new figures from Housesimple, an online estate agent, show that the North-South price divide within the property market has narrowed somewhat. 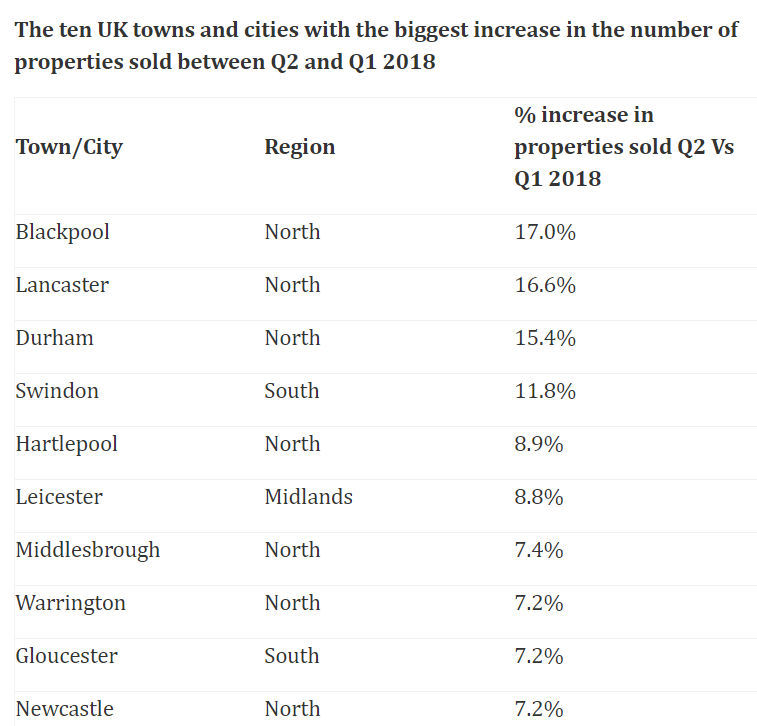 In fact, the North seems to be forging ahead, with seven out of the top ten towns for growth in property sales being in the North of the country. On average, property prices in Blackpool are amongst the lowest in the UK. However, the seaside town is experiencing a rise in property sales right now. Houses sold in Blackpool jumped by 17% between April and June in 2018 compared to the first three months of the year. This makes it higher than any other town or city in the UK. Lancaster and Durham are also experiencing strong levels of growth (16.6% and 15.4% respectively). Buyers seem to be attracted by affordable prices and a booming jobs market, according to Housesimple, which is explaining some of these figures. Family homes, in particular, are still affordable in the north of England and local economies are currently thriving therefore, people are attracted to the larger northern cities like Liverpool, Manchester and Leeds. People are used to house prices in the South of England soaring. However, this also means that they’re out of reach for many people, especially those trying to get onto the property ladder. Deposits for houses in London and the South East, alone, are around four times the average income of the buyer. Having said all of this, UK house prices fell to the lowest level in more than five years towards the end of 2018 because of household budgets being tighter due to economic uncertainty surrounding the outcome of Brexit later this month. The housing market is set to continue struggling to gain momentum until a deal is reached. However, it is expected that the North-South divide in property prices will continue to narrow over the next five years, with the Midlands, North West and Scotland expected to see the strongest price increases in the market. Is My House Worth More with Planning Permission? According to a report from the Royal Institution of Chartered Surveyors (RICS), it is predicted that the number of houses being sold will fall as we step into the new year. House prices are also expected to fall within the first few months of 2019 before rising by around 1% after that.